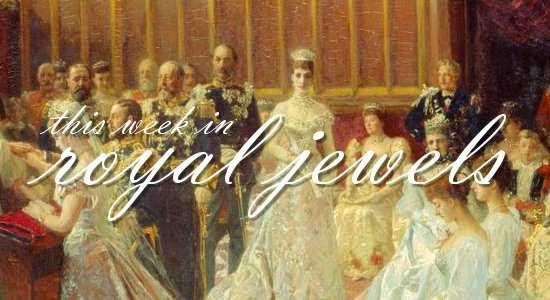 We've got a boatload of earrings plus a necklace-heavy state visit on the menu this week. Be sure to vote for your favorite in the poll below! 10. 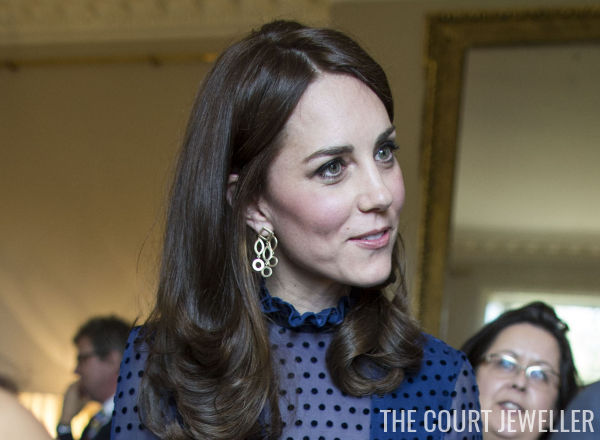 The Duchess of Cambridge wore her Cassandra Goad "Temple of Heaven" girandole earrings for a pre-tour reception at Kensington Palace on Wednesday. 9. Queen Letizia of Spain debuted a new pair of earrings at Zarzuela Palace on Friday: gold and blue quartz drops from a Spanish brand, Coolook. 8. 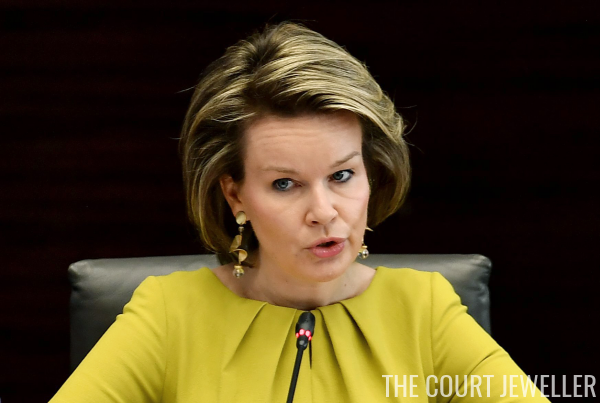 Queen Mathilde of the Belgians wore spiraling gold earrings for a United Nations forum in Brussels on Thursday. 7. 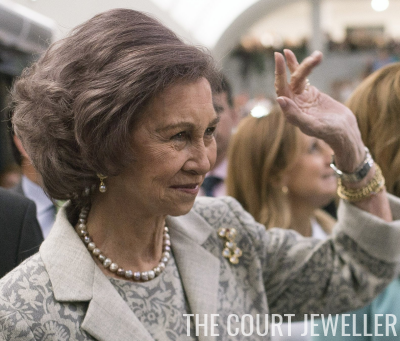 Queen Sofia of Spain, God bless her, piled on the jewels -- pearl earrings, pearl necklace, paired brooches, plus bracelets and watch -- to mark the 40th anniversary of a hospital named in her honor in Cordoba on Monday. 6. King Harald and Queen Sonja of Norway are on a state visit to Italy this week. She wore a pearl necklace and bracelet, plus a delicate ribbon-shaped brooch, to Palazzo Chigi for a visit with the prime minister on Wednesday. 5. 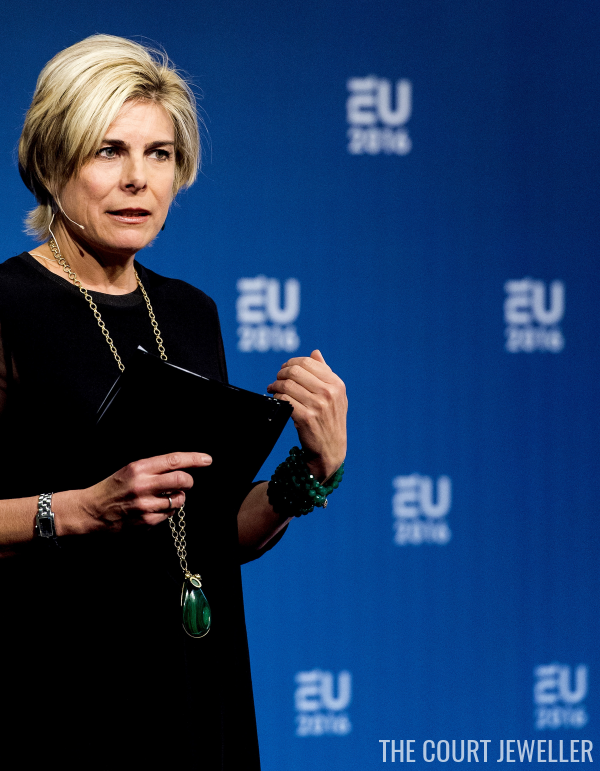 Princess Laurentien of the Netherlands went for the full sautoir -- plus a coordinating stack of bracelets -- to speak at an EU youth conference in Amsterdam on Thursday. 4. Queen Letizia wore an absolutely gorgeous pair of diamond floral earrings at a ceremony for honorary doctorate recipients in Salamanca on Tuesday. 3. 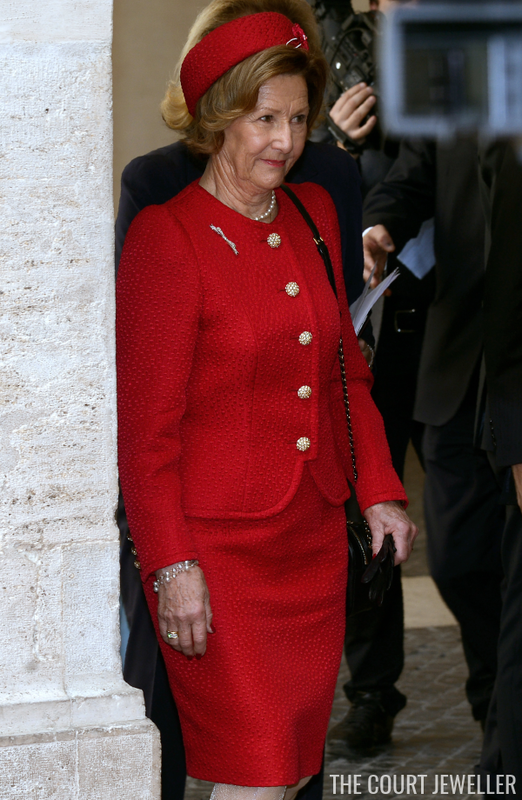 Back to the state visit jewels: Queen Sonja wore an ultra-modern suite of metallic jewelry to lay a wreath at Italy's Tomb of the Unknown Soldier on Thursday. 2. And on Wednesday, Sonja went for a major statement necklace and a stack of bangles for a meeting with the president of Italy's senate. 1. But of course, it's the state visit tiara that wins it for me this week: Sonja wore the small version of Queen Maud's Pearl Tiara 2.0 -- and the Drapers' Company Brooch! -- for the state banquet on Wednesday evening. I actually think the full version of the tiara suits her better, but I'm not going to look a tiara gift horse in the mouth!